Reading With Monie: I've completed my first challenge! Yay for me. I finished my first 2009 challenge and it was pretty easy. My new favorite thing is listening to the audio books in my car to and from work. I also listen to them when I can during work so I can usually finish an unabridged book within 2-3 days. As a side note if you're interested in picking up a bunch of low priced audio books visit your local Friends of the Library sale. I usually find quite a few for $3-$5 and recently I got lucky and picked up about 20 audio books for $1 each. You can also download audio books free from most libraries. Even though the challenge is complete I'll be continuing my list of audio books to track everything I've listened to in 2009. Congratulations - I've about given up on challenges - I guess I'm too impulsive or not goal oriented enough or something. You are fabulous, Monie. Now two ways about it! Good for you. Congratulations!! 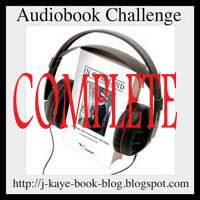 I have finished my audio book section of my 999 challenge as well. I've fallen in love with listening to books. It's like an addiction!! A YA that I listened to that I highly recommend is Thirteen Reasons Why by Jay Asher. I'm not sure that reading the book would have had the impact that the audio had. Good luck with all your other challenges! Congrats! Beat The Reaper is the only audio book I own but my library has a great selection. Wow!I can't believe you already went through all twelve books! I am only on my sixth. Wow! I just finishe Beat the Reaper. I am so glad I listened to it - totally action filled and the reader's voice so suited the story. I loved Beat The Reaper on audio and so did hubby. I'm not at all sure I would have loved it so much if I read it instead. The narrator was a lot of fun. Becky, I've added Thirteen Reasons Why to my audio wish list. Thanks for recommending it. You're way ahead of me, I've just finished #2! I have a ways to go, but I live closer to work than I used to, so it takes me a little longer to finish them now. Congrats! Congrats on finishing the cdhallenge! Congratulations! I just love that completed stamp over the photo!